Of all the early influences on my reading habits and thoughts about writing, Ray Bradbury was probably the least. The man's sheer popularity put me off. And his damned cheerfulness. It would have been easy enough to meet him and chat, but my "father's generation" of writers (that is, the ones he grew up on and who still lived) intimidated me just a bit. I had a fine afternoon on a bench once with A.E. van Vogt, not realizing who he was. But Ray? Well, no mistaking him. Call me an idiot and I'll agree. The sheer joy of the man speaks so loudly and clearly what I feel when I write and translate; his call to "surprise yourself" is my best practice, and I understand too well the poisoned siren call of money which he warns to avoid. "Live in the library, live in the library, for Christ's sake!" Listen to the first ten minutes where he expounds on the hygiene of writing (and think of MT post-editing!!!) or spend a worthwhile hour to give this Master who has passed from among us the full attention his words deserve! One of the most popular posts to date on this blog is one I wrote about 13 months ago on Finding good translators in which I listed the online search pages for professional associations around the world. There are other lists out there as well. However, when one begins to use these online databases, frustration quickly sets in, because they are in no way uniform in their language, format, search criteria or much of anything else. In fact, the "pros" often seem almost as unprofessional as proZ. 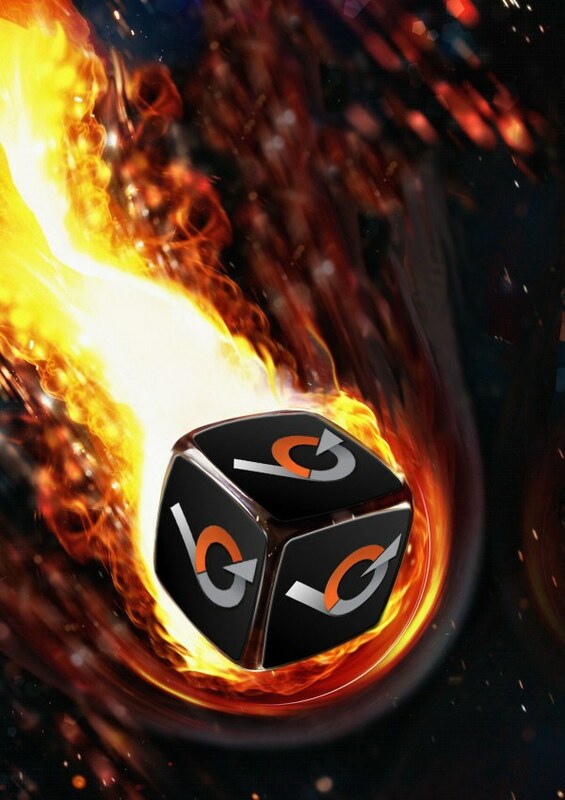 That is why there has been so much excitement since I initially hinted at the possibility of a unified database of qualified professionals with uniform classification criteria and interesting features such as "fuzzy matching" of subject areas. The idea came up in a chat with the database architect, the owner of LSP.net, who created the basic database structure and matching algorithms over the course of a decade of considerable research and investment to enable another small company of his (the translation agency zappmedia GmbH) "punch above its weight" with a few project managers doing the work of two or three times their number using what is now marketed as the commercial product OTM (the Online Translation Manager). Although I used this database structure occasionally for about three years as had the friend and colleague who introduced me to it (a progressive pro association officer), neither of us considered a possible link between the world of commerce and the needs of often commercially naive professionals. Silly, really. My friend at LSP.net had no idea that I had been talking off the ears at the ATA, ITI, BDÜ, SFT and elsewhere for ages pushing for this and said in a rather puzzled manner the day before I tried to take my first vacation in ten years, "But Kevin, it already exists. The work is done. The associations can have it." I was, needless to say, a bit speechless. "What's in it for you?" I asked. "Well, I can use it too," he replied. 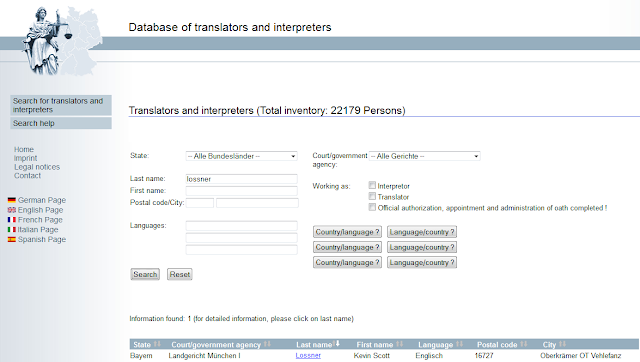 Those association databases are mostly a waste of space, and my PMs and I waste too much time looking for the right translator if that person isn't already in our existing records." Made sense. Almost too much sense. "But why give it away?!" I asked. "Because I can. It costs me nothing now. The work is done. I'll need a few days to set up the admin so the associations handle their own data, but so what? They can have that. Late Christmas present. It's just time that someone did something to make a real database. And we already did. The best." I knew that was true, knew there was no way that any translators' organization would match the resources invested here or the expertise in IT. But my God - even his competitors could use this! Direct clients and individuals could search directly for the most qualified translator in an association anywhere in the world! And what would become of ProZ, where the search results are dominated by much more important factors like whether a translator has paid monetary tribute to King Henry's Argentine Junta or shopped a bride with his Ukrainians, collected Kuhdose points, P'd red and other great stuff? Qualifications? Yeah, right. 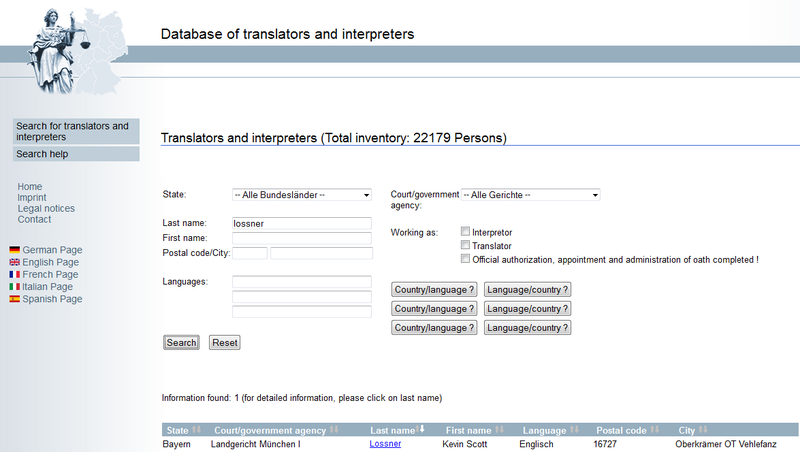 But in the midst of all this Sturm und Drang about about Ze Ultimate Worldwide Translators und Interpreters Get Gigs Yesterday (ZUWTIGGY) tool, I discovered another pretty awesome free database of translators and interpreters and maintained at public cost by public agencies for public benefit. In five languages no less. For some years I had heard rumors that my status as a court-sworn translator with Munich's District Court I could be looked up online, but none of the people who seemed so terribly interested in "proof" of my qualified pudding seemed to know how to execute the complex incantations required to tease such Secrets from the World Wide Web. I didn't know either, so I just tried the old fashion approach of if hours or days of clever research have yielded nothing, just ask Google. So I did. Minutes later, I found myself in another Land, "aus dieser Welt gefahren" so to speak. There was this guy, Kevin Scott Lossner, who seems to be a sworn translator for "Landgericht München I". Damn, that was hard! Searches can specify region (important perhaps if time is critical or you need on-site service ASAP), the sort of service provider you seek (translator/interpreter), whether the court oath has been executed in fact and what languages are involved. Postal codes, cities, names, and German federal state can also be used as search criteria. There are over 22,000 persons in the database. I suspect that not all of them are under oath as I am. Or just click it now if you are a translation buyer or private individual who needs the services of a sworn translator or interpreter. The Database of Delivery from the Valley of the Shadow of ProZ will offer a more "granular" search, i.e. you can find a freak like me who can do research chemistry and understand, translate and certify documents about it, but it's still purty durned NIFTY.